After the tasty farmer's market dinner I had here about half a year ago, I was absolutely thrilled when I got Auntie Em's email that they're doing it again this week. So I reserved asap and decided later on who my plus one is (in hindsight, I probably should've reserved for four, given how many others were interested in such an event. Lessons for next time, I s'pose). 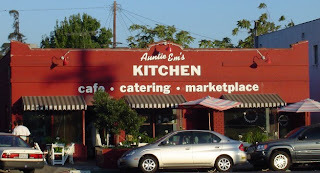 For those not familiar, Auntie Em's is an Eagle Rock cafe and marketplace well-known for their brunches, cheese selections and red velvet cupcakes -- and of course, their occasional dinners showcasing seasonal farmer's market produce. And no corkage to boot (it's BYOB, and they often partner with nearby Colorado Wine Company for pairings). Arugula, bread, moroccan carrots, avocado and heirloom tomatoes salad - very complex, I can't place what specific type of dressing it was, but the vinaigrette tied together the salad components very well, from the pepper arugula punch to the sweetness of the carrots (more natural looking and tasting than anything I've seen in a market, btw) while cutting into the avocado's richness. 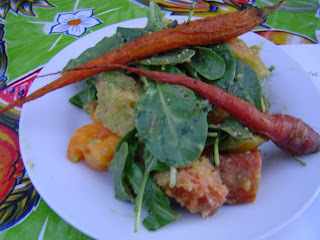 The dressing-soaked bread also added some substance to the dish. 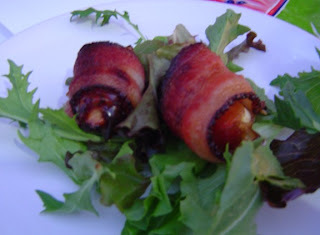 Next came medjool dates stuffed with blue cheese and wrapped in pancetta; so simple and so stellar! I loved the layering of the flavors as you pop it in to chew: first the crispy, fatty, salty bacon, then the chewy, caramelly date, and finally the tangy creamy pop of the blue cheese. Just 'wow' (and yet another easy-but-elegant appetizer idea for the future). 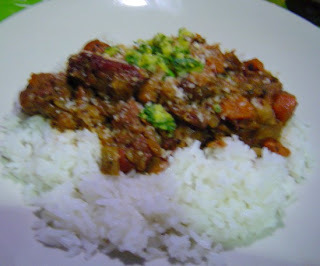 I got the smoked paprika and beer braised pork stew with chickpeas, topped with gremolata served over basmati rice. Like the other dishes thus far, it's pretty multi-faceted. A little smoky, a little spicy, and I tasted an occasional zing from citrus zest. The pork itself was very tender and neither too fatty nor gristly. Overall, a well-balanced yet intriguing dish -- I kept discovering new flavors and scents with every bite. 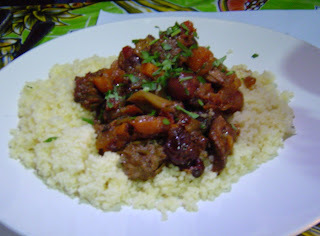 As delicious as the pork stew was, I think I actually liked my friend's dish - lamb tagine braised all day with chiles, tomatoes and raisins over couscous - better. I loved how non-gamey the lamb was, the sweet component from the grapes, and the textural contrast between the fluffy grains of couscous against the tagine (moreso than my pork stew and rice). And, like the stew, it's one where I kept finding new flavors with each pilfered bite; thank goodness my friend is such a good sport about "sharing" the dish. Unsure if we could finish off a bottle of wine, I opted instead to bring two Sierra Nevada's Anniversary Ale, a medium-bodied, slightly malty IPA which paired pretty nicely with the spicy, aromatic dishes we had that night. But it's funny how I picked this ale pretty much on a whim, and discovered later that it pairs well with Indian, Southeast Asian cuisines (and I guess Moroccan would fit here too, given the stew-y nature of its dishes and frequent use of spices). I am no food expert (particularly for Moroccan foods, which I had only once before), and even less well-versed in beer, but it's nice to think that I have an intuition of sorts on what would go well together. After we finished every last lip-smacking morsel of our entrees, we were served with the cheese plate - featuring Westfield Farm's Wasabi Capri (soft goat's milk, the mostly-white one in the photo), Wisconsin sheep dairy co-op's Dante (aged hard sheep's milk, the one with the brown rind) and Townsend Creamery's Trailhead (firm cow's milk, the long pale-yellow strip) with accompaniments of sun-dried tomatoes, homemade jam, almonds, toast and crackers. Not as dynamic as the cheese plate at the last dinner (maybe because I'm VERY partial to Hook's cheddar), it was still pretty good in its own right. The Townsend was pretty mellow, and reminded of a mix of parmigiano-reggiano and cheddar with a mozzarella texture. 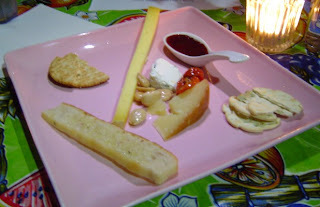 The Wisconsin sheep cheese had a more pronounced tangy and nutty flavor, and was good with the tomatoes. But my fave this time is definitely the wasabi disc, with its creamy texture and the occasional pungence hitting my nostrils. But all in all, it was a decent plate highlighting a variety of cheeses, and it was fun to mix and match with the various accompaniments. 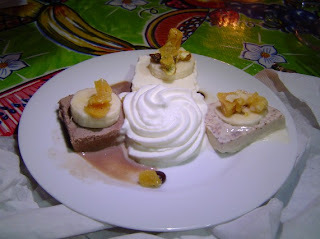 Finally, dessert -- a very whimiscal "Bollywood meets Hollywood" banana split - with coconut, malted milk chocolate, and chai spiced kulfi topped with banana slices and pistachio, macadamia and hazelnut brittles. Again, amazing flavors and textures at play -- each of the respective kulfi had a mild but noticeable flavor (my favorite was the chai, though the coconut one was fun too since it had shredded coconuts embedded within) and the brittle gave it a good, nutty crunch. My only peeve with the dessert is that the kulfi had ice crystals within, so wasn't as smooth as I'd like. Perhaps it was prepared ahead of time and not as carefully frozen? wow, looks like so much fun! always wanted to try that, thanks for the review. You're on a roll! 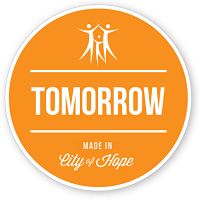 ...more! More! OMG You are making me miss Eagle Rock SO BAD! I lived really close to Auntie Em's and I have to say it was one of my fav. spots in town...and that's saying a lot because Eagle Rock has some GREAT EATERIES! I love foodies and I love Auntie Em's! Oh and the Colorado Wine Co. is a great place to meet and greet the cool residents of Eagle Rock! It was a wonderful and worthwhile experience, I'll be sure to send more of an advanced heads-up next time they're doing this. Ha thanks! Now where's that GreekFest post? Eagle Rock is definitely an up-and-coming eating town. My top three are Larkin's, Oinkster and here! Not to mention some sea salt caramels from Little Flower Candy Co.
Those Moroccan carrots look pretty cool. At first, I thought they were grilled parsnips. 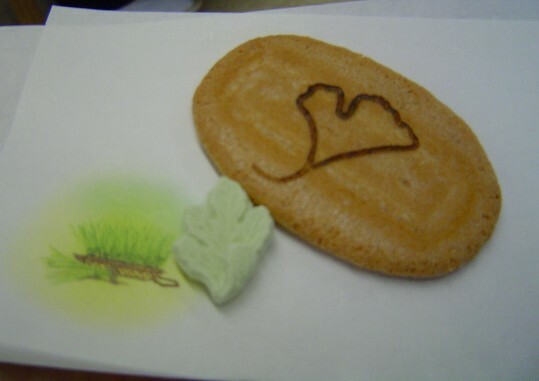 Swan song for my summer sweet . . .